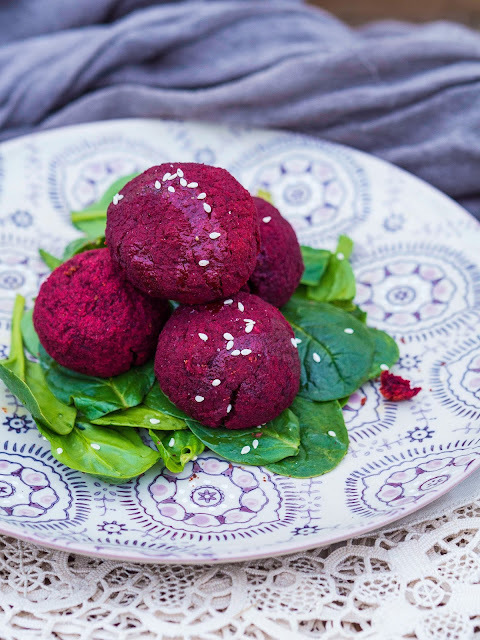 I'm a long-time fan of falafel and love experimenting with different flavours, with today's recipe showcasing sweet, earthy beetroot. Falafel may, on first impressions, seem like a complicated dish to make (a bit of a faff!) but it's surprisingly simple and this version is no exception. The preparation in this four step recipe is so quick (in fact, grating the beetroot is the longest step!) and once the falafel are in the oven, you're free to carry on with chores or activities. I served these at the Sark fitness retreat which I catered earlier in the year and they proved really popular, even converting those who had claimed not to be fans of the pink root vegetable. They can be enjoyed hot or cold and are particularly delicious served with my Classic Hummus. Top tip: wear gloves when handling the peeled beetroot to avoid staining your hands! 1) Preheat oven to 200 degrees C. Grease a baking tray with a little olive oil. 2) In a food processor, place the beetroot, chickpeas, gram flour, garlic, cumin and salt & pepper and whizz together until smooth. 3) Form into balls, each approximately the size of a golf ball and place on the prepared baking tray. 4) Bake for 30 minutes.